It may take a small miracle for the Philadelphia Flyers to make the playoffs at this point. In fairness though, their fans have already witnessed one already this season: Sean Couturier continuing his development as one of the top young stars in the game. Couturier’s potential was never a secret, going No. 8 overall in the 2011 NHL Entry Draft. Even though he had been at one point projected as a first-overall pick and had fallen slightly in the pre-draft rankings, Couturier’s skill and size was always been there. After all, he did make a direct jump to the NHL in 2011-12 with a decent 27-point rookie season. What is a surprise is his second consecutive 70-point season in the making as we speak, though. That’s not just because his first pretty much came from out of nowhere as he turned 25, when upon scoring 76 points, he effectively doubled his 39-point career high up to that stage in his then-seven seasons in the league. No, it’s more a surprise, because of how 2017-18 ended for the shooting star. A nasty collision caused by teammate Radko Gudas in practice thankfully looked more serious than it actually was for Couturier, who only ended up missing a single game of the Flyers’ first-round series against the Pittsburgh Penguins as a result. The concern was very real though, considering Couturier had missed large chunks of time in consecutive seasons from 2015-2017 with multiple lower-body injuries. Perhaps it shouldn’t come as a shock that the Penguins shut the Flyers out 5-0 in that Game 4 that Couturier missed. Scoring six points in the remaining two games of those playoffs, including a hat trick and five points overall in the Penguins’ series-clinching Game 6, Couturier was clearly no worse for wear. This season has been further evidence of that fact. Couturier’s not only scored 70 again, but has already matched his career high of 31 goals. He’s just three off the 76 points he scored last season, with seven games left to play. Considering just a few short seasons ago he found himself unable to gain any kind of traction from out of then-head coach Craig Berube’s doghouse, it’s all the more impressive. Berube seemed intent on developing the defensive side of Couturier game by burying him the Flyers’ zone, all the while expecting him to produce like record-four-time-Selke-Trophy-winner Patrice Bergeron… literally, based on Berube’s own comments on the matter. It all seemed less tough love and more Twilight Zone, with Berube seemingly drawing a line in the sand with regard to Couturier’s deployment. Mercifully, with Couturier’s overall development arguably at risk, Berube was relieved of his duties after two seasons at the helm. Berube was then replaced by Dave Hakstol, under whom Couturier received more offensive opportunities. More importantly, Couturier began to make the most of them. Couturier went from scoring 37 points in 82 games under Berube in 2014-15 to scoring 39 in 63 under Hakstol the next season. He had been starting 64-plus percent of his starts in the defensive zone under Berube. That normalized to above 55 percent under Hakstol. 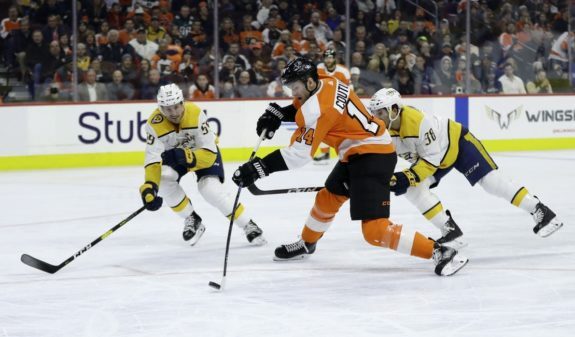 These days, to take advantage of his offensive skill as much as possible, the Flyers have him starting just 51.7 percent of his starts in the defensive zone. There’s a good chance history will look back fondly on Berube and, even his predecessor, Peter Laviolette for how they chose to develop Couturier. 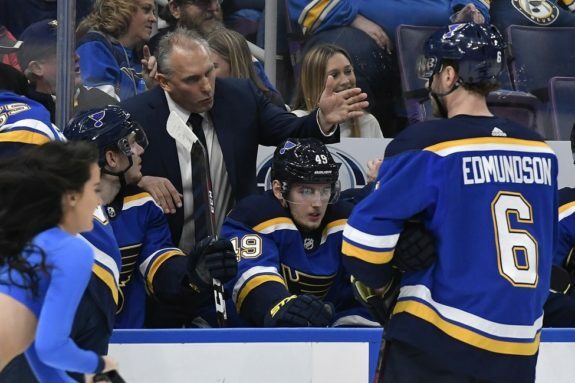 After all, both have gone on to find success with their next head-coaching gigs, Laviolette with the Nashville Predators and Berube with the St. Louis Blues this season. Generally speaking though, it’s common practice to want to handle high draft picks with kid gloves and cushy zone starts to protect them, give them as much of a chance to succeed as possible. Looking at it from another angle, it’s maybe a testament to Couturier’s skill instead. He’s been in the league eight years now and has already had four different head coaches, with Scott Gordon now filling the position on an interim basis. More to the point, he’s only 26 with a lot of seasons left in his career. It’s looking more and more like they’ll be good ones too, the next three of which will see him earn a paltry $4.33 million on average. Considering his production over the last two, maybe that’s the miracle instead.